Stamps > Lawn Fawn Stamp "How You Bean? 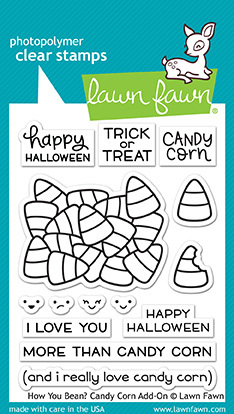 Candy Corn add-on"
Lawn Fawn Stamp "How You Bean? Candy Corn add-on"
You don't need a sweet tooth to love this stamp set (but it helps!) These stamps coordinate with How You Bean? to make adorably sweet halloween cards and crafts! Made with care in the USA!